Salads are a great way to slim down, stay alert and fit during your workday. This will be one of may posts to come in the next few weeks on different salads that you can easily prepare and take to work with you. You’ll be amazed on how much money you’ll save, how much better you’ll feel and how much you’ll gain appreciation for healthy foods that you make. This is such a refreshing salad, perfect for Spring and Summer – absolutely delicious. Carefully wash and dry Baby Spinach so not to bruise leaves and place into your serving salad bowl. 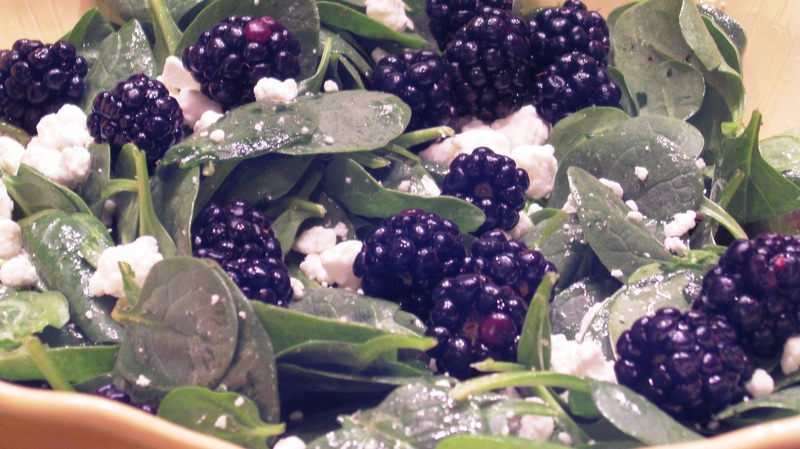 Add olive oil, salt and pepper and toss lightly, add goat cheese and blackberries. – Serve and do enjoy! We suggest pairing this with a heavier entrée such as Rack of Lamb with sautéed mushrooms. Holy cow. That sounds marvelous! I know what I’m having for dinner!